Nathan Hill looks at five characters that entered our hearts through the big screen — and the effect they had on us. Fish fanatics are able to spot an aquarium at five hundred yards, through fog, wearing sunglasses. In the dark. A fish tank for us is an eye magnet, something to be scrutinised, summarised, and all too often criticised. If there’s water with fish in it, we’ll sniff it out, and usually from a distance. I myself, like many aquatic-minded that I know, seem to have an innate ability to sense and find streams and rivers from a mighty distance. Whether this ability for ‘water divination’ is something inherent in every one of us, or whether it goes hand in hand with the hobby, is something I’d be keen to discover. We will be the first to notice a goldfish bowl in the background to some advert about air fresheners, leaping up on to the parapets of our sofas and lecturing our friends, family and/or partners as we go on a tirade about how irresponsible the advertisers are for sending out the wrong message. We whip ourselves up into a frenzy of righteousness at any perceived indignity to a fish. Or at least, I do. Some fish, however, have been not just a prop in a pretty, minimalist house, where a chemical company tries to sell us all manner of poisons to make our lounges smell nicer. Some fish have hit the big time, taking centre stage and making the whole world sit up and notice. Here are, in my mind, some of the most influential. If you’ve not seen Jaws then you’ve either grown up in a region without televisions or cinemas, or something has gone very, very wrong. The film was one of the highest grossing of all time, taking over $400 million dollars globally. It seems a lot of people were interested in killer sharks. Nowadays, you cannot go to a public aquarium without someone pointing at any generic shark and saying ‘Jaws’, nor can you expect to traverse any of the displays without hearing at least one wit recreating the characteristic ‘derrr der, derrr der’ soundtrack associated with frolicking bathers about to be torn into strips. The film has had a lasting, enduring legacy. Unfortunately, not all of it has been good. Whether linked to the film or not, a surge of popularity in shark fishing sprang up after this blockbuster. Equally fast to proliferate was a total lack of understanding about how sharks really behave. Alas, there is always that mindset that whatever happens in a film must be based around truth, and all too many people are ill equipped to make the critical judgement between what is reality, and what is fiction. A generation of folks refused to so much as dip a foot in the seas, while trophy hunters, potentially spurred on at catching the ultimate in big game, drove sharks numbers spiraling downwards. Whether sharks would be in the popular view without the advent of Jaws is anyone’s guess, but the fact remains that whether for good or bad, the image of that deliberately oversized Carcharodon carcharius will remain etched into the psyche of the world for a few more generations to come. Plot: (the important bit) man eats other man’s fish, gets crushed by steamroller later on in revenge attack. The fish in ‘A fish called Wanda’ didn’t feature too heavily in the storyline, except of course for where they were systematically eaten alive by one of the film’s main characters. However, the strength in this film, and the reason I’m prompting it as influential, is that it had a subliminal ability to encourage the viewer that aquaria were tranquil things. Admittedly, there was some stigma involved, casting the owner of the fish (Michael Palin) as a stammering tree-hugger type, but on the whole the soothing music, the gently panning shots over fish living in total harmony – these things added up to make people want an aquarium. I was a school kid at the time, and I recall the number of friends reporting their parents had bought aquaria right around the time of the release of that film. I’d like to think that these parents weren’t even aware of the influence that inspired them to buy the tank in the first place. In fairness to the film, the tank in question was a nice medley, but maybe not the kind of community we’d try today. Clown loach alongside Red tailed black shark, Golden gourami, Neon tetra, Black mollies, Kribensis, and of course the film’s namesake, Wanda the (very pleasant) Angelfish. Plot: Fish that can translate brain waves and sounds cause huge wars but prove handy as universal translators. The Babel fish appeals to a large subsection of sci-fi fans, and acts as a kind of badge of identification between those who are ‘in the loop’ and those who are not. Why is it important? I’m not strictly sure. With nothing more than conjecture, I’d like to think that it inspired a generation of people familiar with the Hitchhikers series of books to maybe not take supposedly ‘simple’ animals as fish for granted. Plus, in the televised series, Babel fish looked an awful lot like Neolamprologus leleupi, and I know that I ended up keeping a clutch of these on that single, flimsy basis. Plot:Military experiment to create strain of ultra-hard mega-piranha backfires when fish escape, requiring their annihilation before they reach the sea (where they can survive). Hoping to cash in on the success of Jaws, Pirahna managed to popularize the South American piscivore in the mainstream mind, but did in such a way that people realized (or at least most did) that the Pirahna conveyed didn’t actually exist. Instead, the film gave rise to very popular notion – maybe by way of counter protest at how very wrong it got it – that Piranha are in fact shy creatures and no threat to humans. Subsequent attempts at the film have been an exercise in televisual dumbing down of the highest order. More scantily clad beach babes, more genetic engineering, uglier and scarier fish and if that’s not enough they turned the film 3D into the bargain. Why does this turn out to be influential? Because the film planted seeds. 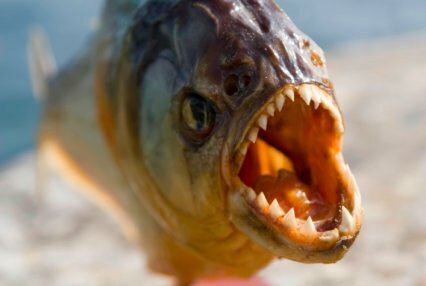 It aroused curiosity into people about Piranha, but they had to do their own research to find what the fish were really like. And on the back of lessons learnt from Jaws, people with the right information were ready and on hand to shoot down any falsehoods and outright errors before they could go global. Ironically, most of the disinformation about Pirahna now is actually down to poorly made, sensationalist documentaries, keen to spice up the content by adding a bloodthirsty, sadistic element. Plot: Just go and watch it if you haven’t already. It’s cute, you’ll love it. Andrew Stanton’s animated clownfish brought in a global revenue of $868 million – so far. With the 3D version imminent, I think it safe to say that this figure has some way to climb just yet. The film’s genius lay in its ‘casting’ or at the very least its attribution of personalities to the fish involved. Features of the fish’s characters are wonderfully in keeping with their actual natural tendencies for shyness, gregariousness, or even their restless activity (and who could forget the wonderful cleaner shrimp, unable to stop himself from cleaning on request). It appears that any early fears surrounding the film were on the whole unfounded. The trade was pretty much ready for the wake of armchair aquarists who now suddenly wanted to take the plunge, although some deplorable practices such as trying to sell goldfish bowls with salt and clownfish were observed by at least one retailer. Shame on you, I’ve a long memory. The other big fear was the prospect of a surge of ‘fish flushing’ as kids returned their pets to the sea via their toilets, but this never really occurred. On the plus side, a wave of aquarists who had never considered embracing the hobby were now facing the pester power of kids who wanted a Nemo of their own. Of course, some of these sudden neo-aquarists were doomed to failure, unable to grasp the intricacies of water testing and correct chemistry. But others flourished, bringing with them a new energy to the hobby, and putting together some superb tanks – I’ve seen a few – once they inevitably found a hobby digging its claws into them. I think it little surprise that the years directly following the film saw colossal growth of marine retail, both dry and fish. And if you’re wondering how that helps you in your home keeping, it means that companies had higher revenue, hence bigger spends for research and development. There are more than a few recent advances in the trade, I’m sure, that likely wouldn’t have occured were it not for the extra cash injection that this new wave of hobbyists brought along. The biggest thing with Finding Nemo is that it very much imparted a little fishy information to everyone that watched it. Now there is no doubt in anyone’s mind that clownfish live in anemones, nor that a tank will soon become filthy without a filter. As much as there was a comical element to all proceedings, there was so much hard information delicately imprinted on to the minds of the lay viewer, that nobody who watched that film could help but to learn a little bit about fishkeeping, whether they wanted to or not. So how about any fishy films that influenced you? Was your love for puffer fish brought about through watching Deuce Bigalow? Perhaps you harbor a desire for a shark tank of your own, a-la Bond villain extraordinaire? 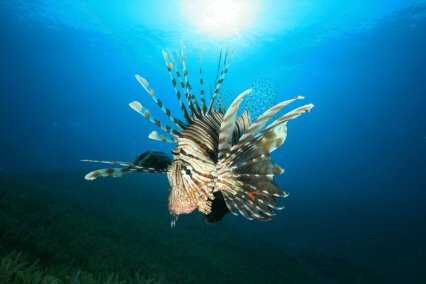 Maybe the Lionfish in Naked Gun is the reason you now have a 180cm tank with a Pterois volitans in it? You tell me, but I’ll bet a couple of you have been influenced by the big screen.